Give me a break ! 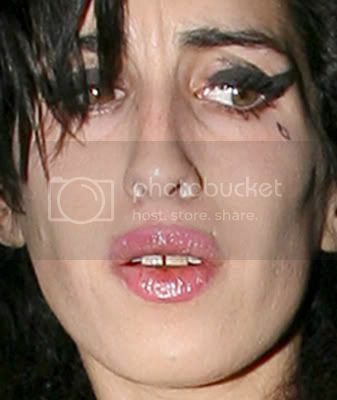 Amy Winehouse’s doctors are not sure what is wrong with her! Maybe TB, maybe a chest infection. They are saying Amy might have to ditch two huge gigs because docs are still trying to figure out what’s ailing Amy. The Winewreck is still in the hospital in London after collapsing Monday, and her rep says she’s being given "additional scans and tests" to determine just exactly what happened. Let me give them a hint – crack, cocaine, drug overdoes….. get a reality check – do her doctors really expect us to believe poor Amy just has a virus. Amy is supposed to play next weekend for Nelson Mandela’s 90th birthday, and then the next day at the big Glastonbury festival. Forget about her being sick, they should have cancelled her on both these events after that racial video of her was shown…..
What’s that White Powder in Your NOSE Amy? Amy Winehouse Outside in Just A Bra! Who Has A Towering Beehive and Tacky Bling? Amy Winehouse! Amy Drops The Gloves Again!